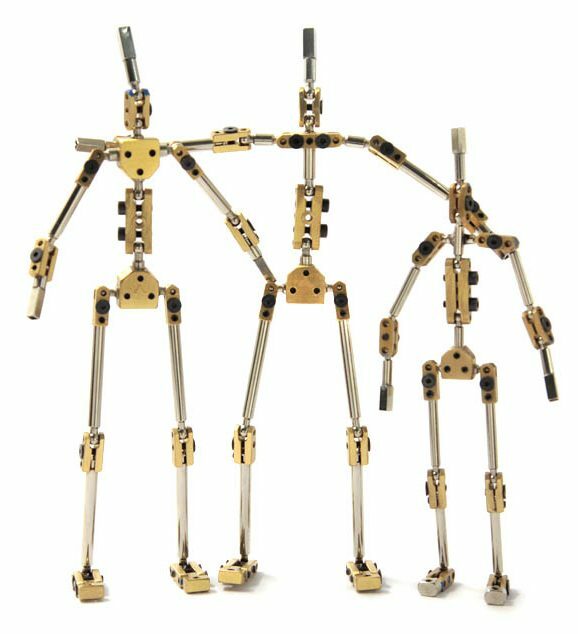 These metal structures are posable puppet armatures, mainly made of steel and brass. They are completely articulated and can hold a position firmly, an important and needed feature for stop motion animation technique. Hand crafted, all the puppets in this site are made piece by piece in Barcelona by machining professionals and assembled in the shop to ensure all the pieces works fine. The main difference from other brands are the strong rods with the turned balls on it, that avoids from breaking apart any ball. We have two different measures available, k1 armature – k2 armature that is 21 cms hight and k3 armature 15 cms hight. If you need a special puppet armature visit the custom section in this site for more information.